Fentanyl is an incredibly powerful synthetic opioid analgesic that is rapidly changing the landscape of the opioid epidemic. When used appropriately, fentanyl is an effective pain mitigator, and is used most predominantly in cancer patients or individuals suffering from chronic pain. Like heroin, morphine, and other opioids, fentanyl works by binding to the body’s opioid receptors, which are located in areas of the brain that control pain and emotions. When the fentanyl binds to these receptors, it increases dopamine levels in the brain’s reward centers and produces an intense state of euphoria and relaxation. Unfortunately, like all opioids, fentanyl binds to opioid receptors in a non-discriminatory way, meaning that it not only attaches to the opioid receptors in the brain’s reward centers, but also to the opioid receptors located in other areas of the brain, including those that control breathing. Thus, while fentanyl does produce an incredibly potent (though fleeting) high, it can have devastating physiological impacts that can potentially lead to death. The difference in potency between heroin and fentanyl is a function of their different chemical structures. While both heroin and fentanyl bind to the opioid receptors in the brain, fentanyl’s chemical make-up allows it to arrive at the opioid receptors much faster than heroin. Fentanyl also adheres more tightly to the opioid receptor than other opioids, which means that only a small amount is enough to catalyze the molecular chain of events that initiates the opiods’ effects on the body. 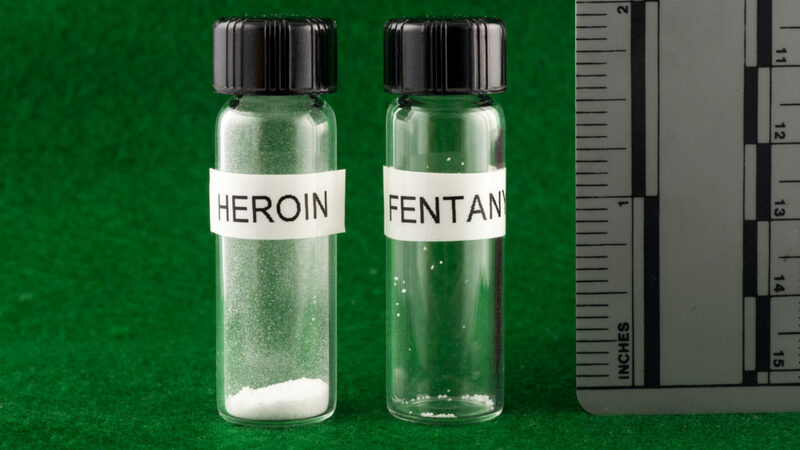 As a result, a minuscule dose of fentanyl can have the same lethality as a much larger dose of heroin (pictured above is a visual representation of the lethal dose of each respective drug). Use of fentanyl, and consequently fentanyl-induced overdoses, is rising in pockets all across the country. Users are gravitating toward it because of the prospect of a more euphoric high, while dealers are gravitating towards it because it is a potent mixer than can enhance the addictive quality of their product. This combination has proven profoundly lethal, and drug deaths involving fentanyl more than doubled from 2015 to 2016, and are up 540% overall in the past three years. Fortunately, there are organizations like Column Health that are dedicated to reversing this trend, so please don’t hesitate to reach out if you or anyone you know is struggling with addiction, and especially if they are struggling with addiction to fentanyl.